Oh what fun…! These oils are free this month if you’re on Essential Rewards. Don’t get me wrong. I LOVE being with people. I LOVE being cozy. But winter can be hard! I just get antsy and feel a little off when I can’t be outdoors during the long winter…especially when the hustle & bustle becomes a little too much. This is a powerful oil for cleansing, freshening, and purifying. Click here for some DIY gifts using Lemongrass! It’s a key component in the oil blends Purification and PuriClean. As far as supplements go, it’s in the Inner Defense capsules, and the Slique CitraSlim detox/weight loss capsules too. DIY “Inner Defense” capsules: 2 drops each Vitality oils Lemongrass/Thieves/Oregano/Thyme+ 8 drops olive oil. Take 1 daily in the winter, or every few hours when needing critical immune system support. Hot Tea: (my fave). Dip a toothpick in the oily rim, then stick it in your cup of warm green tea. Add a toothpick dip of Spearmint Vitality, and it takes like Starbucks/Teavana’s Jade Citrus Mint! First Aid: I apply to affected area with some Lavender (nothing else!) to cleanse and promote healing. Here’s a post with more fun diffuser blends! Pine (15ml): This one is soooo perfect for this time of year. Respiratory support, fresh and clean air, and an overall festive seasonal scent. Put 8 drops in the reservoir of your reed diffuser ornament (with a tiny bit of rubbing alcohol and some water) if you got one of those last month! Joy (5ml): A miracle of emotional oil blends. The modern version of the “oil of gladness”… ;) I’ve watched this one do wonders on the attitudes of babies, children, and myself …too many times to count. Click here for my post on Joy Essential Oil Blend. Also balances hormones with its Geranium and Ylang Ylang oils. Click here for some DIY gift ideas using Joy, Pine, and other evergreen oils. I’ve talked to many moms and people in the education/healthcare/social work industries who wish this was sold by the gallon. I put it on my forehead and shoulders religiously before family gatherings, nannying, and any time there’s non-pleasant, un-chill people around. Not exactly sure how the science works on this one, but it is helpful for staying rooted and protected during a bombardment of people, noise, chaos, and negativity. Some of the oils have been used for millennia for grounding, clarity, comfort, and protection, like Myrrh, Bergamot, Sandalwood, Spruce, Rose, Melissa, and some other powerful oils. A good one to slather on before a holiday gathering where Negative Nancy, or any other Christmas cheer vortex is in attendance. Also incredible if you’re used to little ones draining all of your you-ness and emotional energy. Many people also sing the praises of this oil when diffused to help little ones sleep deeply and nightmare-free. This is my 3rd favorite blend (and that’s saying something…because I have like 10 favorite blends.) It is powerful for helping me to gather my thoughts and really zone in to what’s important. Black Spruce, Sandalwood, Cinnamon, Geranium, Frankincense, Lavender, and other oils comprise this rich, warm & spicy, masculine-smelling blend. It amplifies my focus on linear-left-brained tasks like work, but it can be ESPECIALLY helpful when it’s hard to turn OFF the logical problem-solving brain and any chaos or racing thoughts. I love it for tuning into right-brained things like prayer, meditation, creativity, and just being emotionally aware and fully present. If you have the book Releasing Emotional Patterns by Dr. Carolyn Mein, look this one up! Frankincense: Its beauty and power transcends the ages, thanks to modern distillation techniques. Once only afforded by royalty, the wealthy and healers/physicians, this unbelievably tedious-to-produce oil still yields priceless benefits. If the miracles it does for the skin on your face, and the miracles it does for your mood aren’t enough to make your jaw drop , then check out some of the science on its chemistry! The compounds incensole acetate (providing neurocognitive, neuroprotective support) and alpha-pinene (cell-protection/generation) will blow your mind. I’ve even heard of people getting it via an IV! 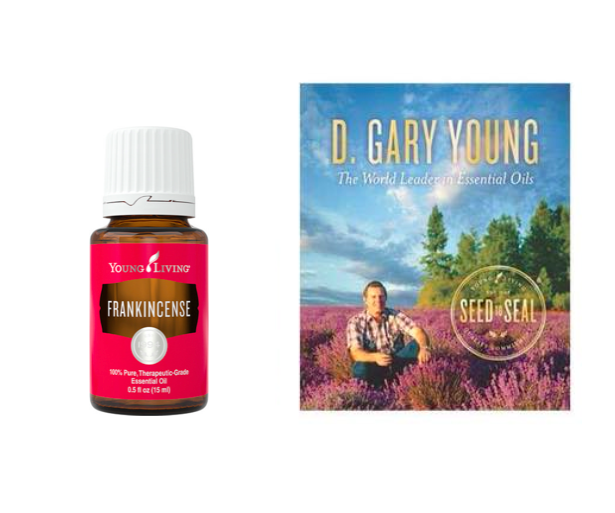 Seed to Seal - D. Gary Young book: Excited to finally get this! It tells the story of the founder of this company and his unbelievable journey to health after a crippling accident, as well as the incredible birth and development of Young Living Essential Oils and the meticulous care, research, and planning that went in to nurturing the farms, developing machinery, and perfecting the process that produces the purest oils in the world.